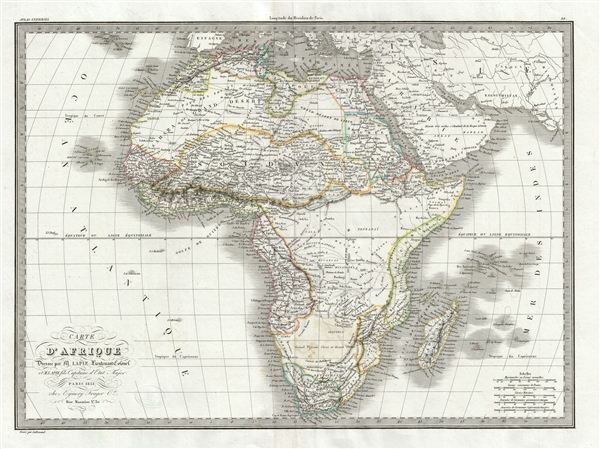 A fine first edition example of M. Lapie's 1831 map of Africa. Medieval maps had long depicted kingdoms throughout Africa, often represented as icons accompanied by textual descriptions that accompanied the maps. When european enlightenment cartographers and administrators insisted on more scientifically measured maps, these kingdoms were swept off the map. Home to numerous kingdoms and rapidly forming nation-states, Africa suddenly became a terra incognita on many maps, populated if at all with savages ripe for enslaving, and natural resources ripe for the plucking. european private interest in Africa grew, and the involvement of their governments increased. As european citizens and administrators penetrated further inland, they encountered resistance from dominant peoples, but also welcome from subordinated peoples seeking protectors or ambitious rulers seeking allies. At the time this map was made, the slave trade, thriving since the 5th century Arab slave trade and reaching its height in the 1700s, was rapidly decreasing due to dropping demand for slaves in the New World, and due to the British outlawing of slavery in 1808 and subsequent diplomatic efforts, signing treaties with over 50 African rulers outlawing the practice, as well as a de facto naval blockade. Many African economies adapted by shifting to the export of mineral and agricultural resources, which led to the european scramble for territory, occupying most of the continent by the end of the 1800s, and haphazardly carving up the continent into territories that often forced historic enemies into close proximity, still a major cause of conflict today. The map covers the entire African Continent from the Mediterranean Sea to Cape Colony and from the Atlantic Ocean to Madagascar and the Seychelles Islands in the Indian Ocean. It also shows parts of Spain, Turkey, Asia and Arabia. This map was engraved by Armand Joseph Lallemand as plate no. 39 in the first edition of M. Lapie's important Atlas Universel. This map, like all maps from the Atlas Universel features an embossed stamp from the Lapie firm. Rumsey 2174.039. Phillips (Atlases) 754, 765.